This study presents preliminary results of petrographic and X-ray fluorescence analyses of cut stone blocks used for urban construction at Teotihuacan, the capital of a regional state in Central Mexico (ca. AD 150–650). Cut stone blocks were concentrated in the civic-ceremonial core of the city and were probably prestigious architectural elements due to their higher costs of procurement and transportation compared to alternative materials (boulders and clay amalgam). This suggests that the organization of stone block procurement and distribution was likely embedded in power relations between commissioners and mining groups. By combining multiple analytical methods that complement one another, this study was able to discriminate local (within 10–15 km radius) from non-local materials. The results suggest that the majority (> 80%) of andesitic cut stone blocks were brought from non-local sources. This paper discusses procurement organization and suggests that most rocks were quarried by specialized groups and brought to the city through a tribute system and/or patron-client relations. This has implications for understanding the nature of the urban-hinterland relationship and expansion of the Teotihuacan state. The online version of this article ( https://doi.org/10.1007/s12520-018-0619-5) contains supplementary material, which is available to authorized users. 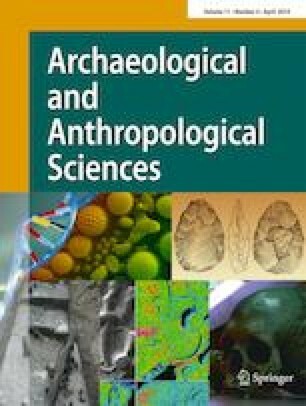 The lead author (Murakami) would like to thank the Consejo de Arqueologia for their permission to conduct research, as well as Alejandro Sarabia, the director of the Zona Arqueológica de Teotihuacan, for providing logistical support for archaeological sampling at Teotihuacan. The study presented in this paper was made possible by financial support from the National Science Foundation Dissertation Improvement Grant (BCS-0836716) awarded to Murakami and a National Science Foundation grant (0504015) awarded to MURR. Finally, we thank Chris Oswald for his assistance in the analysis of the samples by XRF and Alex Jurado for editing help for an earlier draft of this paper. Comments and suggestions by two anonymous reviewers greatly helped clarifying our argument and the scope of the paper.